"BlueJeans: A Great Solution For Video Conferencing "
BlueJeans is very easy to use and great for large office spaces. It is easy to log in and on calls with either the BlueJeans link or with the remote control. There is really nothing that I dislike about BlueJeans. Sometimes the link does not always connect with our AV system but it is easy enough to login or call in. I think that it is a great product and I would highly recommend it to any business with employees in different offices or different areas. We use this to video conference with our different offices and clients. It is a great way to collaborate with our different offices. The video is always clear and the sound is great. I think that it makes it feel like you are right there with your coworkers and clients to make necessary decisions for the business. I also think that it is great that you can present a slide deck or share your screen when applicable so that everyone is looped into the mix. How easy it is to set up an event and how little time it takes. It was a little confusing in the beginning on the difference between scheduling an event and scheduling a meeting, as well as the different roles of the moderator and presenter. It would have been nice to been provided a 'white sheet' on how to and the differences. I understand the need for the role of the moderator, however, it would be nice if this was an optional role for an event. I also wish you could edit the event/meeting title after it has been created. This has caused a few issues in the past as meeting/training event titles have been altered. I have also ran into issues trying to upload a video to play during an event so more information on how to do that would be appreciated. Great product that is easy to use to connect people from all over. We have been able to seamlessly conduct meetings with participants here at our headquarters and in our field locations states away. This has been very beneficial to our organization. "Great UI, but lacking some basic requirements "
The look and feel of BlueJeans Events is amazing. It's intuitive, and that's something our customers definitely need. It's quick to launch and not cumbersome. I love that the audio and video are combined. Previously, we had a separate phone number for our WebEx audio. It's very nice that people can now use their computer audio to listen to the presentation. I also like that the audio can be muted for all attendees, but wish we could unmute them as well (see below). We have several moderators on our team and it's frustrating that, if one person creates an event, no one else can access the reports, recordings, or see a list of future courses. It would also be helpful if we could unmute attendees if they have questions. Yes, they can type questions into the Q&A section, but it's easier to unmute everyone and let them clarify what they're asking verbally. When creating an event, make sure you have more than one moderator. If the current moderator gets sick, and no one else is assigned that role, you're not going to be able to launch the event. Know that there is a sizable lag time. Be sure to account for those 20 seconds when asking if anyone has any questions. We have several Instructor-Led Trainings every week to help our customers use our software. Our customers sometimes have limited technical knowledge, and BlueJeans' great UI has helped mitigate a lot of issues we used to see with WebEx, such as people not being able to log in, or having issues with the audio. We have several moderators on our team and it's frustrating that, if one person creates an event, no one else can access the reports, recordings, or see one list of future courses. It will be helpful if we could unmute attendees if they have questions. Yes, they can type questions into the Q&A section, but it's easier to unmute everyone and let them clarify what they're asking verbally. Know that there is a sizable lag time. Be sure to account for those 20 seconds when asking if anyone has any questions. I like it so much!! that is so great I like it so much We have several Instructor-Led Trainings every week to help our customers use our software. Our customers sometimes have limited technical knowledge, and BlueJeans' great UI has helped mitigate a lot of issues we used to see with WebEx, such as people not being able to log in, or having issues with the audio. "BlueJeans - It's what you want it to do"
The software and web platforms are very stable. There is no head-scratching and troubleshooting involved when trying to join a meeting. It is very quick and responsive. There is no lag time in joining a meeting. The sound and video quality is superb. The command center software could be more streamlined as the UI is a bit busy. I often find myself fumbling with the menu options and drop-downs. It is very easy to join especially with the Google Calendar integrations. More often that not, all I have to do is click a link, and the software will launch and join my meeting. BlueJeans is being used across our entire organization. It allows our employees to collaborate without being physically present. We use it primarily for meetings, but also have used it's large presentation-type broadcasts. It is an essential tool for our company because we have several offices across the world. We also have several home-based employees, which makes BlueJeans very useful. "The perfect solution for big events"
The number of people that can join in the events. We need to accommodate at least 5000 people and Blue Jeans can fulfill that. It is also easy to moderate from my desk or at the actual meeting. Video Quality. We can never seem to get the full video quality in our broadcasts. It has become frustrating that our broadcasts are only getting somewhere between 360P and 480p video quality. This is a great product that will fill your small local meeting needs or your larger event broadcasts. The amount of people it can reach is amazing. Town Hall broadcasts to the entire company, many of which are remote. We average around 4000 individual users. Its amazing that we can broadcast easily to that many people. The video and audio fidelity is unmatched by any other service. It is much better than competing solutions and does a great job of meeting our needs. We can easily have 500+ users connect to a meeting without having to worry about anything dropping out. Event link is easy to share and web app is just as reliable and desktop app. I wish the mobile application was a little more intuitive. Wish that the online app allowed you to rearrange your live event dashboard so you can more easily hide things you don't want or need. If you have large meetings 250+ and users that are connecting from international locations this is a great solution. Allowing 100+ users to easily connect to an event with little latency and no down-time. "BLUE JEANS IS THE BEST PLATFORM FOR MEETING, AND BROADCASTING!" I love the price firstly. Secondly, I love the easy design and functions of the platform. Thirdly, I love the fact that I can conduct meetings, webinars, events, and broadcast to Facebook Live. I wish that the scroll bar on the video section was larger. It is barely visible to find. I strongly recommend you try the Blue Jeans platform. What do you have to loose? You get a free 30 day trial. It is so easy to operate and learn, that you will subscribe before your 30 days expire like I did! I am in the media and entertainment business. Blue Jeans help me handle all aspects of the things I need to do with ease. I can meet with my staff. I can broadcast my entertainment shows and events to Facebook. And, I can hold private meetings for training, auditions and much much more. "A true leader in Conferencing and Events solutions"
The look and feel of BlueJeans is immediately intuitive. The interface is clear while still being comprehensive enough to have full functionality. The ability to stream meetings and events to Facebook Live provides an 'easy-in' to promoting your message over social media. Video quality is currently not as high resolution as some others. Will general users notice? Probably not as the video is 720p by default and is very clear even at lower bandwidths, not to men ion that this means that it is very efficient for your internet connection. I understand that there are upgrades to the quality very soon, so this will be an added bonus. Check out with the Dolby HD Voice Hardware if you can. The sound quality using this is by far the best that I have heard from a conferencing system. We have used various tools for Webinars, none of which have provided everything that we have needed. Primetime has been a real boost for hosting events. The ability to hold a traditional streaming webinar, with full reporting, chat facility and live polls all in a simple to use interface is fantastic. Add to this the ability to then upgrade streaming viewers to fully interactive participants on the fly and it opens up a lot of possibilities and options for how events are managed and structured. "Great Tool for large group video events and presentations"
The data that BlueJeans makes available to you for troubleshooting and resolving issues for end users in the presentations is very valuable to those of use running meetings. The moderator tools and flexibility for users to connect from almost any device is a great feature. The architecture of the product revolves around users getting a buffered feed and at times end users can be about 30 seconds behind the live presentations. This can cause some minor issues when fielding questions from the audience or attendees. BlueJeans Product Implementation team is great and can give some good demos and walk you through the product. They are a great resource in evaluating the product. Our teams have never been more connected across offices throughout the US. "A love hate relationship with BlueJeans Events"
What I love most about BlueJeans events is the user interface. It's very easy to grasp for both moderators, presenters, and attendees. The Q&A and chat feature is very obvious to attendees and without too many bells and whistles doesn't confuse them on the functionality. Having played with the moderating function for about a couple hours I was able to grasp everything fairly easily. It's cumbersome when it comes to creating similar events. Our company utilized WebEx before making the switch to BlueJeans. It allowed us to create a template of an event and build from that each time we needed an event scheduled. We have about 4 events weekly that are very similar in setup, so having a template feature would do wonders. One thing I have a love/hate relationship with is that attendees cannot speak during events and promoting everyone to presenter is cumbersome. The ability to be able to mute/unmute our attendees when needed without having to go through the process of promoting them to presenter is a must and is sorely missed from our old software. Inability to run a single attendance report for all events across a specific date range is baffling. I do save all attendance reports for each event myself, but I need the ability to run a report for the entire year to see how many people registered, attended, or were absent. Only the creator of the event can access attendance information. This causes a gap in information if the original creator is out on vacation. The other moderators don't know how many attendees registered (if any at all) for the event nor do they have access to their information afterwards to send any necessary follow up. The lag between moderators/attendees makes for a bad experience on both ends. Some benefits to BlueJeans is the ease of use which helps us as a company and team bring in new people to use it with relative ease. What's not to like. More robust than competition. Easy access to moderator controls. Ability to promote attendees to presenter is a game changer. While I understand the use case for a different app, user adoption is slow. They still have the ability to join via browser but I would love it if attendees could join via BlueJeans app. Browser requires flash :(. Do your homework. This solution is great for our use case, but it may not be for everyone. We use Events regularly for global meetings as well as meetings for our larger team. The ability to have a dedicated presenter list but still have the chat interaction is great. The simplicity of the interface makes it quite easy to manage and train end-users in its various features. We run in to issues every so often with the MS Outlook plug in disabling itself and users complain about the buttons disappearing from Outlook. We have multiple company events each year that require all office locations to connect to a Blue Jeans event. The software has met our needs for these types of events. The functionality of Blue Jeans is superior to other applications we've tried. The ease of presenting and adding content is great. We love the feature of muting all microphones and cameras when needed. There is a bit of complexity to being a moderation and adding other presenters. It is just a matter of learning, but we usually have to do a little training before our first run as moderator. We have business-wide events, town hall meetings, all college meetings, and smaller team meetings. We also use Blue Jeans for project development. This is useful because we have a lot of remote employees. "BlueJeans - Great for Groups"
I like that BlueJeans is intuitive to use. The features make sense to me. Also, there are customizable settings. For example, I like my meetings to start without the moderator, that way no one is waiting on me to activate the room. I don't like how the BlueJeans recurring meetings work. Whenever I have tried to set one up, it will not sync correctly with Outlook. If I need to make a change to it, I'd need to recreate an entirely new BlueJeans event. With BlueJeans, we're able to have phone conference meetings with the additional benefit of being able to share your screen. It makes discussions more productive and easier to communicate. We also use BlueJeans for webinar purposes. The invites are easy, as well as the self-sending reminders. The moderator interface is supreme. Complete control over all in the meeting, chat for troubleshooting, recording options and the download options of recordings. I use the recordings to edit the meeting and post in our employee enterprise site. Choppy video play over livestream. I usually have to send videos to users ahead of the meeting. We use events several times a year to connect for all hands meetings corporate wide. We are diverse global company, using Events to bring us together on a monthly basis. The process is seamless and consistent. We recently tested several webinar platforms and found Bluejeans Events to be an extremely solid one - we already use Bluejeans internally as our virtual meeting platform and liked the ease of transferring knowledge to Bluejeans Events. It's a good looking interface that's simple to use. The meeting video and audio quality is generally high. This software is significantly more expensive than very equivalent or even superior competitors. Given our particular needs, we went in a different direction. I would recommend BlueJeans Events to organizations with a larger budget available for their webinar software - for smaller organizations, there are better options available. Bluejeans Events is solid and fairly reliable; it allowed us to host events with certainty that there wouldn't be major issues. "An Effective and Connective Livestreaming Method"
BlueJeans Events bring the company together in fun and innovative ways. There can occasionally be some lagginess in the connection, but as technology improves, this will hopefully decrease over time. It is a very simple system to use. With the right hardware, you can even connect a high quality camera for better video and audio streaming. The company I work for has branches in multiple parts of the world. BlueJeans Events work great when we want to get information out in a fun and interactive way. The dashboard makes it easy to run the event, control the presenters and respond to Q&A. The Bluejeans technical support I have received in urgent situations has been amazing. I find it difficult to get the presentation to display for the dial in audience at times. Monthly business review with retail team up to 100 people that attend in person and on the phone. Bluejeans has enabled us to bring our Home Office and remote field leaders together each month for important business updates. "BlueJeans is great for collaboration"
BlueJeans has a simple interface for videoconference and screensharing, with good audio/video quality. It integrates with room systems well as well as personal devices. The administration interface could be improved and more responsive, particularly when you are looking at current meetings. BlueJeans has been a good tool for our company. Its on par with all of its competitors. We use BlueJeans Events for company wide meetings that are larger than the BlueJeans user limit of 125. "Exactly what we need and nothing more "
BlueJeans Events is user-friendly and makes it easy for our team to set up a webinar and to host dozens of teachers at a team for learning events. There enough controls to make it customizable (i.e, Q&A, raising hand, switching between camera views) but not too many that it becomes confusing. It'd be great if a user could be moderator and presenter, rather than have each role sign-in separately. We have to set up a lot of computer/use a lot of different accounts just to set up one webinar. The largest benefit is being able to reach out to much of our organization at the same time and being able to interact with them. I like BlueJeans meetings best, and BlueJeans events a little less. The slide delay for attendees is about 10 seconds, which is extremely long. Can't share an application, only a screen. Chat is difficult to manage, with a separate conversations in a separate tab. Can have multiple presenters for a single slide deck. Don't look for option(s) to share control of a slide deck. Webinars for researchers every couple of months. Easy to connect to. For events you are automatically muted and video off so it is easy to attend. Connection is usually fast and high quality. There isn’t much to complain about. The latest update changes how you interact which takes some getting used to but overall, no cons. We are a global company so leadership will put on events for the whole company though this tool. We love the fact that participants come in without being able to use the microphone without being given the permissions. This make large meetings easier. We have had delays or slow connections at times, usually due to internet connections of our moderators. We are solving our large group meeting dynamics. This is much easier to use than other programs we've used in the past. BlueJeans Events is the best tool to manage large company meetings. Having to upload videos prior to event. It makes it difficult when there are last minute changes. Ease of upload features for files, videos, etc...Or event better not having to upload into the tool for viewing during a meeting. We save meeting space rental fees and your tool provides global reach. "Simple video conference with Google integration"
Love how I can sync up my Google calendar with Bluejeans and add unique meeting IDs. Sharing video is pokey when not uploaded prior to a meeting. The ability to connect with people outside our company is simple. They can join with the a simple link through their computer or call in over their cell phone. Easy to sign in, it is easy to share the bluejeans link on google meetings. You can record calls. Bluejeans events are awesome & interactive. Generally very reliable system. Bluejeans Events is a great feature that allows us to increase our participation and engagement during trainings. "BlueJeans allow our remote users to be part of the team." You don't need to be a technical guru to join a meeting. The initial setup was not straight forward. But once you set it up the first time you will be all set. BlueJeans events allow us to convey the company culture to our remote office and users. "Great product simple to use- Perfect for large events"
Works on different platforms, from large events of over 1000 people to a small meeting of a few people. No matter if someone is on a mobile device or Board room it all matches up. Travel costs- No need for travel to sites. Large Events are terrific. BlueJeans Events is intuitive and easy to use. The design is simple and aesthetically pleasing. I really like how it talks with other programs and is compatible with many of the other applications we use. Being able to have an easily accessible and easy to use medium for communicating with large groups of people. BlueJeans Events has opened up communication lanes that otherwise might not have been opened. "Generally good experience with BlueJeans Events"
Overall the quality was pretty good and the video/audio held up strong through most webinars. We didn't like having to use a different interface than what we were used to with Blue Jeans' regular interface. 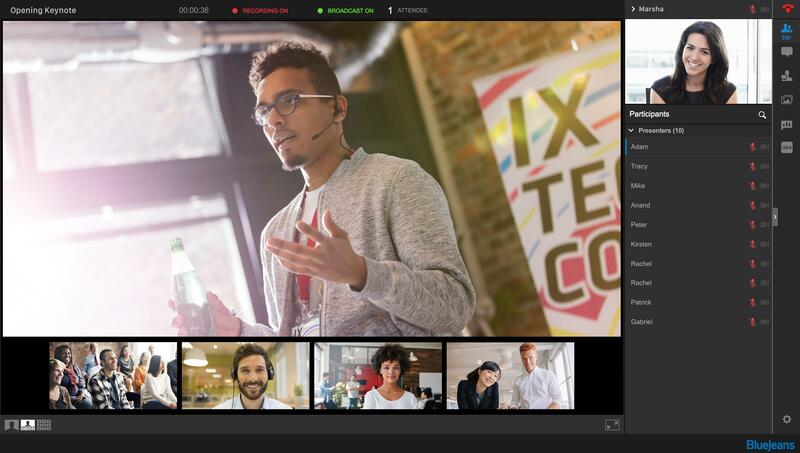 Be sure to familiarize yourself with the Events interface and dashboard if you are also using Blue Jeans for normal video conferencing. The Events dashboard is different. Hosting large employee meetings and training sessions in multiple states. "Easy to use conferencing software"
Bluejeans has allowed us to have our entire nationwide sites be able to communicate seamlessly. It's easy to set up, and easy to switch between different sites for effective voice and audio. Sometimes internet connection could be an issue, but I believe that is more internet than the applications fault. Being able to communicate across all of our different sites in the US canada and mexico. "Good streaming service, but expensive"
The customer support was top notch. We got quick responses from Alphi when service was interrupted, and the demographics report afterward was helpful. The price was pretty high. While the service was good, it made more business sense to broadcast on a free platform like Facebook Live. "Blue Jeans Technology Has Not Kept Up "
Initially, we really liked that Q&A were well-integrated and aligned with our content. The Blue Jeans platform has been very unstable for us. We decided in early 2018 to stop using the platform to stream content that is uploaded to the Blue Jeans server because the application dashboard that plays the videos glitched. We were hosting large-scale, university-wide events on the platform. "Simple and reliable solution "
I like the ability to pair the service with a Cisco video codec. The interface is a bit confusing at first. It helped us reach a very large amount of our employees across many states for important announcements and large training events. I like that BlueJeans supports a large number of participants during meetings. Sometimes there are tech issues with audio. We use it to share information to a large group of employees. The benefit is time. "Use for team/cohort meetings on a monthly basis"
* We monitor all BlueJeans Events reviews to prevent fraudulent reviews and keep review quality high. We do not post reviews by company employees or direct competitors. Validated reviews require the user to submit a screenshot of the product containing their user ID, in order to verify a user is an actual user of the product. Hi there! Are you looking to implement a solution like BlueJeans Events?